A Basic Income program (giving every adult a monthly survival stipend) like the one explored in my earlier articles… would only be practical in countries with a low fertility rate and low population growth rate. Read more in those other articles…. As one reader (Ricky) implied in a comment on an earlier article, having too many hungry mouths to feed is a chronic problem in human culture… and a Basic Income program would just make matters worse in many situations. An economy that is already precarious and weak from overpopulation would become a shambles with a Basic Income program that takes money from the Haves and distributes it to the starving masses of Have-Nots. Overpopulation has always been among the primary causes of sick economies in human cultures down through the ages… but never as severe a problem as it is today, as I examine in the Vitality Ratio. More about that in the Vitality Ratio…. I’ve long believed that economic aid in today’s world (and that includes a Basic Income program) should always be tied to some kind of population-control policies that try to keep population at a safe, healthy level. 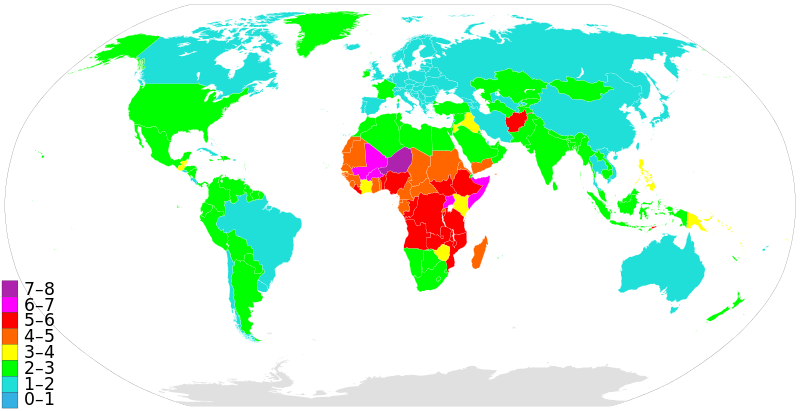 So, here’s what I’d suggest: Launch Basic Income programs generously around the world, as long as a country’s fertility rate or population growth rate allows it, as shown in the maps below. Blue nations are the most stable and would be well suited to a Basic Income program. Green countries are on the border and could also accommodate Basic Income. The yellows, oranges, reds and purples indicate countries with precarious population growth, which would have to be gotten under control before Basic Income (or any other economic solution) would really help. Countries shown by fertility rate (number of children borne per woman). Countries shown by population growth rate (annual percentage of growth). When you compare the two maps – – fertility rate (top map) and population growth rate – – you can see that other factors like migration and mortality rate can have an impact on a country’s population-related economic stability… not just the fertility rate. Both of these maps are important in getting the economic snapshot of any country in today’s world… and determining whether a Basic Income program would be viable. I’ve become fairly certain in the past few weeks that a Basic Income program, coupled with a Wealth Tax to shrink the gap between super-rich and super-poor, hold the biggest key to the economic salvation of the modern world. Finally, a universal Season’s Greetings from the master of technical (albeit somewhat illusory) cosmologies… NASA! This entry was posted in Heaven and Earth, Our paradise destiny, Politics and Economics and tagged basic income, fertility rate, population, Vitality Ratio. Bookmark the permalink. I am very happy to contribute to this discussion! I think that addressing the overpopulation issue would be a wonderful safeguard to ensuring the success of such a program. I can only imagine what a program like this could do – if it were to be delicately/surgically-implemented. I would love nothing more than to see the world become a “modern-day” Atlantis – although from a technological standpoint, Atlantis was probably a lot more advanced and “modern” than we are today. I came across some footage/brief coverage of ITC from a paranormal documentary that I was watching very recently. (I’ve been fine-tuned to ignore all sensationalism in these documentaries and to focus on stuff that could potentially be real, or at the very least, hard to explain from our primitive scientific understanding.) The coverage begins at 29 minutes and 13 seconds into the video. A man by the name of Dr. Kaku is shown attempting to provide explanation for the footage shown on the TV screens. I automatically knew that he would be another skeptic – as he proves himself to be. He appears to have somewhat of an open mind and would be happy to believe it – under the right conditions. I think he has all but ruled out ITC’s legitimacy – and he doesn’t quite understand the background or history of how all of these scientists came together and became convinced of otherworldly-communication. I agree; population should factor into any serious economic studies or assessments. Its main thrust is not to understand afterlife and spiritual matters, but to find a balance between the believers and skeptics. For me that’s a silly drama that’s gotten kind of old and boring. Thanks, Mark, for giving the Basic Income idea a decent hearing. But I have a few problems with various aspects of your analysis. First, I think it crucial to specify at the outset that basic income, as it has evolved over the past 40 years, today means universal, unconditional Basic Income Guarantee (uuBIG). The two u’s are crucial prefixes for solving the problems which you get into in the later parts of your analysis. In fact, they solve all the problems which you grapple with regarding how the system can be funded and maintained, without complicated, bureaucracy managed solutions like a Wealth Tax. The key is that the move to uuBIG must be a simple as possible, leaving as much as possible of what we currently do in place, but producing the greatest systemic benefit. Instead of abandoning the income tax, simply make it fair to all, which allows us to introduce a new mandate for the government: to treat every citizen the same. So the uuBIG, is set at a median level of about 2K/ month, like the Swiss proposal, and not at your sub-poverty level of 1K/month. Now trash the existing tax-code, replace it with a one-bracket system in which every adult citizen pays exactly the same tax-rate, ON INCOME ALONE (with no further need for individuals to fill out tax forms, other than an income report — although businesses and corporations will still be need full disclosure of how they arrive at the net profit on which they all pay a corporate flat-tax rate, and again with no possibility of deductions or “tax breaks” (also note that the new Treasury uses the “real-time” business reporting to manage the economy with the sole mandate of maintain stable prices (because “full-employment” will be unnecessary to insure all citizens economic security). This can be done quite scientifically, as explained by Frederick Soddy in Wealth, Virtual Wealth & Debt, but in a nutshell, the Treasury takes back from the private banking consortium (Federal Reserve) the control of the issue of new money (which means ending the fractional reserve system and forcing banks to lend only money they have on deposit), thereby allowing the Treasury to exactly match the amount of money in the system to the goods and services available, using its two levers on the economy, the level of the uuBIG and the flat tax-rate that everyone pays equally. Hi Francis, MUCH appreciated. It’s good to know there are people out there beating the bushes for Basic Income here in the States… which I’ve come to see as the number-one solution to America’s current troubles. I’d like to compromise with you on one point. Square up and simplify the income tax code as you describe…. but only after a year or two of wealth tax. Considering the grand canyon between America’s super-rich and super-poor at the moment, I’d recommend scrapping income tax for one or two years and replacing it with a wealth tax. That, I believe, would narrow the gap between rich and poor to manageable proportions, and it would also provide enough income to the government to kick off a Basic Income program while shuffling the budget for a new, leaner, more balanced America. Then, scrap the wealth tax after two years and introduce your stripped-to-the-bones-fair income tax. Within three or four years I think we’d have America moving in a healthy direction again… at least economically… raising the poorest of the poor to a level of subsistence. We’ll still need some work on our political bearing, and the use of the bloated military as a tool to further the mercenary goals of US corporations and industry… the subject of my next article. Also, I’ll stick with my suggestion of a $1,000 Basic Income, at least at first. That’ll get everyone in the game, and provide incentive at the lower levels to seek additional income through service and employment. Thanks for your feedback, Mark. Here are a couple of thoughts for your consideration. Mine is not a liberal approach: I won’t be the one to offer a band-aid and a cup of tea to the victim of a brutal beating by thugs. I want to bring down the thugs, and prevent further beatings. Others can offer sympathy. Finally, this can only happen through a constitutional amendment, proposed thru a Constitutional Convention demanded by 2/3 of the States, and passed by 3/4 of the States, which means supported by 80% of American citizens, who would have to be convinced, not only that they will do as well or better under the new system, but that a government that treats everyone equally is the only fair solution to end the current corruption, and they must abandoned the compromise solutions which have brought us to the precipice of disaster we face today. Just like with your wealth tax, no legislative solution is imaginable thru a Congress owned by the wealthy elite (after the Citizens United decision proved who owns our “democracy”), but a popular movement demanding fairness and an end of corruption might just succeed. That’s my hope. I just wish it was yours too. I agree with many of your descriptions of just how the USA is broken. Gotta’ admit, though, I do tend toward the “liberal”… the urge to help the less fortunate. I’m not an anarchist. When a system is destroyed, I believe the result is chaos… and I’m a peace-and-order kind of guy. So, I look at Basic Income as a tool to help heal an ailing America, not as a means to destroy it. I view government more as a brain of a country’s social system, not as a tumor that has to be eliminated. A good government (imho) is one that works in the best interests of the entire system… individuals, families, communities, companies, industries, communication and transportation networks… while also protecting the environment. It helps to hold things together and keep it all healthy. Granted, the current US government doesn’t work that way, but I think a modest Basic Income kicked off by a wealth tax would have a healing effect on the entire system, removing much of the stress from an over-stressed government. It might help the government heal into something a little nobler. Anyhow, that’s how I see it… and that’s my hope.